Make-up is rather favourable for oily skin compared with it on other types of skin. Use an oil-free or gel based moisturiser for oily skin with an SPF value of at least 15 to fight sun damage. Do not overdo powder on face as that may make your skin produce more oil. Exfoliate skin at least twice a week to remove dead skin and excess oil. Just because you have oily skin, you don’t have to ditch make-up completely. Make-up is rather favourable for oily skin compared with it on other types of skin. In fact, it is easier to apply beauty products on oily skin as it stays naturally moisturised. Owing to the tendency of oily skin to shine, slip and melt away the make-up, make-up artists suggest taking precautions while putting it on. Use an oil-free or gel based moisturiser for oily skin with an SPF value of at least 15 to protect your skin from sun damage. A moisturiser with anti-wrinkle properties keeps skin moisturised. 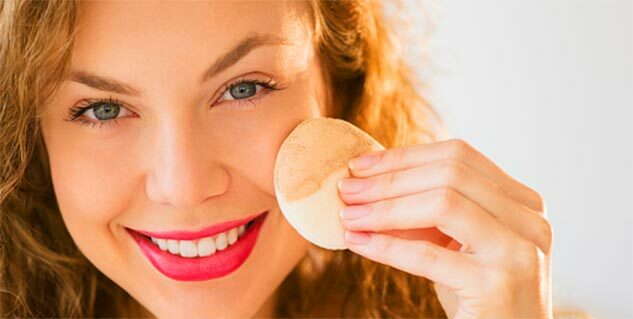 To control the extra oil on the skin, powder may be used. Make sure you don’t overdo it as it may stimulate your pores and make them release more oil. Therefore, the trick is to apply powder only on the areas that are shiny or greasy. Primer helps the make-up to stay. So, it becomes crucial to apply it before make-up on oily skin. Apply an oil-free and anti-shine primer on the oiliest areas of the skin. Those with oily complexion may use blotting paper to remove extra oil from their skin. Rather than rubbing the paper on the oily areas, press the paper and roll it off. There is no point in using beauty products that contain oil on an already oil-laden skin. Always make sure that you use oil-free make-up products so that your pores are not clogged. In order to cut on oil, face cleansers and toners containing glycolic acids should be used. You must do this at least twice a week to remove dead skin and excess oil from the face. Use a cleanser that contains slightly abrasive ingredients. A sponge cloth should be used in a circular motion to clean the skin. After exfoliating, wash your face with cold water. A clay-based facial mask can be used for removal of excess oil from the face. Kaolin and bentonite clay are considered best treatment masks for oily skin, which absorb oil and impurities without causing irritation. In simple terms, it is about learning what is right and what isn’t for your skin type when it comes to make-up. It is important to prepare your skin before putting on any kind of make-up (by cleansing, toning and moisturising with apt products regularly).